Walter Palmer is one of the men whose military record was found by Trevor Lewis and Sheila Marriott, to whom we are grateful. He was killed in action in October, 1916, and is buried at Connaught Cemetery, Thiepval. Walter Palmer was born at South Croxton, Leicestershire, in 1895, son of Lionel Henry and Helen Palmer. Lionel Henry Palmer had two wives. The first was Sarah Ann Firth, who he wed at Keyham, Leicestershire, on the 13th May, 1886. In the 1891 census, Lionel Henry Palmer, a 29 years old grazier, lived at Ivy House, South Croxton, with Sarah Ann (29) and their children Frank (2) and baby Margaret. Sadly, Sarah must have died soon afterwards. Lionel wed his second wife, Helen (nee Walter Ford) from Kirby Bellars, Leicestershire, at Barrow upon Soar in 1893. In 1901, at Main Street, South Croxton, lived Lionel Henry Palmer, a 40 year old grazier and agricultural labourer born at Ingoldsby, Lincolnshire, his 30 year old wife Helen Palmer and their children Frank (13), Agnes (6), Walter (5), Harry (4), Annie (3) and Herbert (1) all born in South Croxton. Frank was his son from his first marriage. In 1911, the Palmer family lived at Hardwick Cottages, Empingham, Rutland. Walter was now 15, and was employed as a poultry and yard boy. Some time after this, his parents became residents in Bottesford. 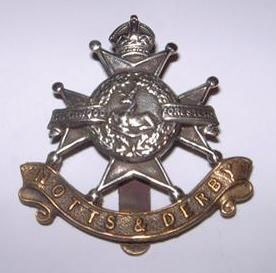 Walter stated that he was resident in Bottesford when he enlisted at Nottingham. Walter Palmer enlisted at Nottingham as 43424 Private. He was posted to the 16th Battalion of the Sherwood Foresters, known as the Chatsworth Rifles. The date of his enlistment is not known. Walter Hardy from Bottesford also served with the same battalion. The Chatsworth Rifles departed for France on the 6th March1916 and fought in the Battle of the Somme on the Thiepval Ridge. Orders were given on the 1st October to press on with operations despite deteriorating weather conditions and the physical state of the allied troops. On the 9th October, the Chatsworth Rifles led an attack on the heavily fortified Schwaben redoubt. The casualties included all the officers who went into the attack and 234 of the men they led. Walter Palmer was one of those killed during the action. He was buried at Connaught Cemetery, Thiepval, Somme. Walter’s parents appear to have been living in Bottesford by 1919 and his father worked on Daniel Daybell’s farm. Lionel Henry Palmer died in 1931, and was buried on the 16th September at Bottesford. Helen Palmer died in 1936, and was buried on the 3rd November alongside her husband. It is not known why Walter Palmer’s name was not included on the War Memorial. However, his name is inscribed on his parents’ gravestone in St. Mary’s churchyard.